So is Brooks Reed really worthy of a first round pick? This and items on Revis, Wilkerson, scout paycuts and other nuggets . . .
For what it’s worth, Pro Football Weekly draft guru, Nolan Nawrocki, who is the best in the business, has Arizona OLB Brooks Reed as a third or fourth round pick. He’s probably going to go higher than that because so many teams need pass rushing outside linebackers. I love his motor and instincts, but I wonder why he wasn’t more productive in college (17 sacks in four years, though he didn’t start as a freshman). He had 8 sacks as a sophomore, 2 as a junior, and 6.5 as a senior. In his defense, he played much of his junior year with a high ankle sprain. Reed might be a reach at 30, but with his speed (4.65), strength (30 reps of 225), intelligance and non-stop motor, he might be too enticing for the Jets to pass up. The Jets have to make sure the 3-4 OLB pass rusher they pick in this draft, loves football – Reed clearly does . . .
Mark Cannizzarro is no longer the Jets beat writer for the New York Post. He is being replaced by Brian Costello, who handled the beat a few years ago, when Cannizzaro was on sick leave. The Post is going to have Cannizzarro focus on his favorite sport, golf, and also do columns on a variety of sports including football . . . There were a couple of question today about the impact of special teams ability on players being drafted. But you know what, it’s not going to be as big a factor this year with the new kickoff rules. Why get too caught up in a player’s ability as a kick cover guy, when half the kickoffs are likely going to be touchbacks? . . . The Jets PR director, Bruce Speight, wasn’t in attendence at the pre-draft press conference. Why? He is on furlough this week . . .
Temple DT Muhammed Wilkerson probably isn’t a good fit for the Jets at 30. His instincts are shaky and he doesn’t have much of a mean streak . . . 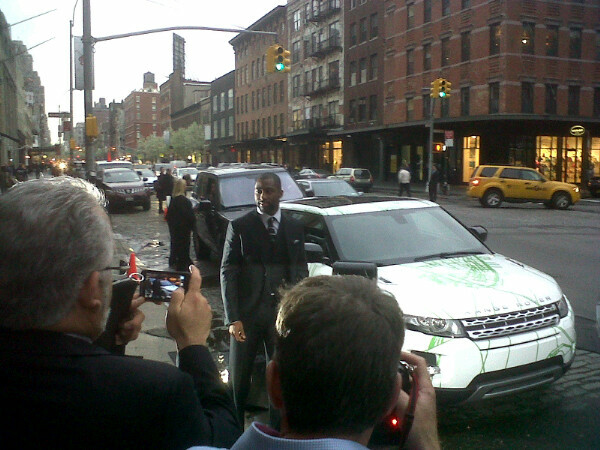 Earlier this week in Manhattan, Darrelle Revis appeared at a promotion for Land Rover. One of the reporters got a nugget out of that appearance, perhaps from Revis or his agent, that was mind-boggling. Revis is owed $25 million for the 2011 season. I kid you not. At first, I thought it had to be a mistake, so I checked with a source close to the team. It’s true! Even if there is no cap this year (if the players win an injunction ending the lockout, and the NFL goes back to last year’s labor rules), that is a lot of money, and definitely will impact the Jets ability to sign all their free agents . . . I asked Mike Tannenbaum today about the the morale of the football staff right now after taking 25 percent paycuts last month. I still don’t know why Woody couldn’t wait until after the draft to cut the salaries of the football stuff. The furloughs for the business side are understandable. There isn’t as much business to do during a lockout. But the draft is a lot of work for the coaches and personnel department. It’s not like the lockout cut back their workload leading up the draft. But the Jets aren’t alone. Other teams did the same thing.